The median rent was $200 and mean rent was $280, in the CNMI in 2017. Units with cash rent of less than $200 was 39% of all rented for cash housing units in the CNMI in 2017; units with cash rent between $200 and $399 was 37%; units with cash rent between $400 and $599 was 18%; units with cash rent between $700 and $999 was 4% and units with cash rent of $1,000 or more was 2%. 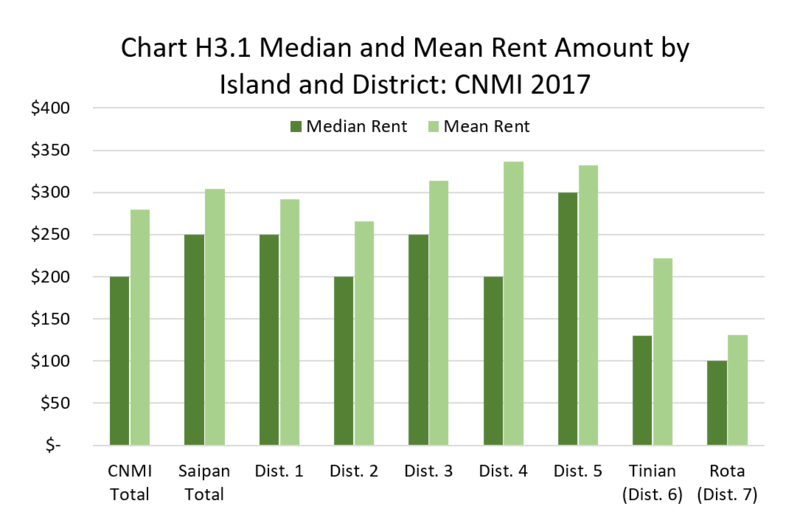 Median and mean rent amounts were higher in Saipan, $250 and $304, respectively; followed by Tinian, $130 and $222, respectively; and were lowest in Rota, $100 and $131, respectively. The percentage of all units with cash rent less than $200 was highest in Rota (83.8%); followed by Tinian 72.4%, and lowest in Saipan (35.6%). The percentage of units with cash rent between $200 and $399 was highest in Saipan (38.5%), followed by Tinian (23.2%) and lowest in Rota (14.0%). The percentage of units with cash rent $400 or more was relatively high in Saipan (26.0%) and low in Tinian (4.4%) and Rota (2.2%). Median rent was highest in District 5 ($300), followed by Districts 1 and 3 ($250) and lower in Districts 2 and 4 ($200). Mean rent amount was highest in District 4 ($337), followed by District 5 ($332), District 3 ($313), District 1 ($292), and lowest in District 2 ($266). 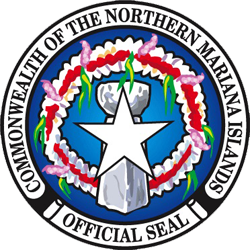 Within Saipan, percentage of units with cash rent less than $200 was highest in District 4 (43.5%), followed by District 2 (42.6%), District 1 (35.6%%) and District 3 (35.0%); and lowest in District 5 (22.2%). 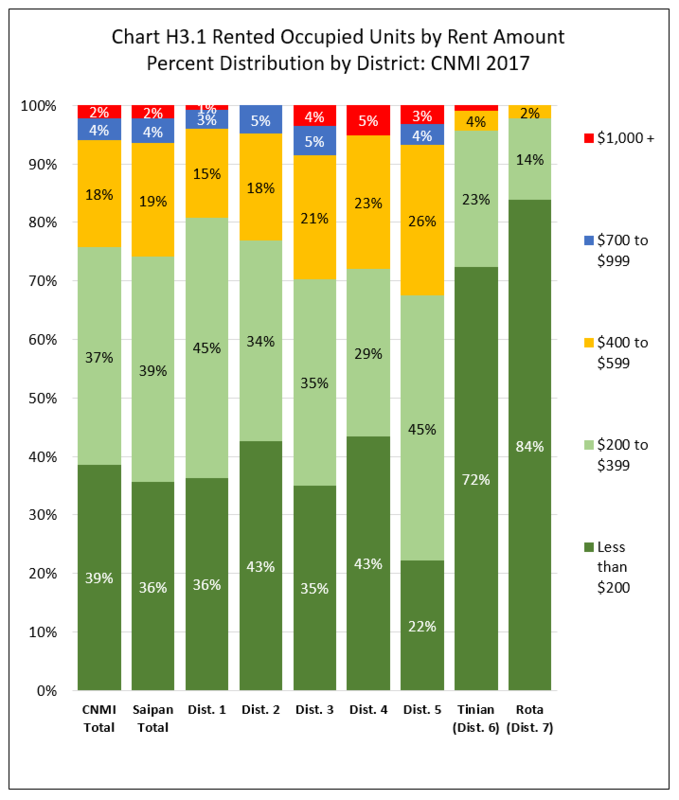 Percentage of units with cash rent between $200 and $399 was highest in District 5 (45.3%), followed by District 1 (44.5%), District 3 (35.3%%), District 2 (34.4%) and lowest in District 4 (28.6%). Percentage of units with cash rent between $400 and $699 was highest in District 5 (25.7%), followed by District 4 (22.9%), District 3 (21.2%), District 2 (18.1%); and lowest in District 1 (15.1%). Percentage of units with cash rent between $700 and $999 was highest in District 3 (5.0%), followed by District 2 (4.9%), District 5 (3.6%) and District 1 (3.2%). Percentage of units with cash rent of $1,000 and above was highest in District 4 (5.1%), followed by District 3 (3.5%), District 5 (3.2%) and District (0.8%). See Chart H3.1 and Table H3.1 for detail. Table H.3.1 Rented Occupied Housing Units by Rent Amount, by Island, and by District: CNMI, 2017 4th Qtr. Source: Labor Force Survey CNMI, 2017 4th Qtr.